Introduction: Worldwide, prevalence of communication disorder in Parkinson Disease (PD) is 89%, however only 3-4% receives Speech Therapy. This highlights the need for an increase in the number of professionals to manage the various communication problems these individuals with PD face. This study was conducted using small sample survey on individuals with PD, medical professionals and Audiologists and Speech Language Pathologists (ASLP). Aim: Information about the need, availability and any other difficulties encountered for communication management were procured. Methodology: 56 individuals with PD, 30 medical professionals consisting of Neurologist and ENT and 158 ASLP were surveyed. To corroborate availability of speech language pathologists, intake capacity of Audiology and Speech Language Pathology students for graduation and post graduation in Mumbai and a rough estimate of their post education status in terms of area of practice was obtained. Results: Though more than 50% individuals with PD face communication difficulties only 5% are taking therapy. Over 50 % medical professionals stated difficulty in finding a speech therapist to refer the individual with PD. Only 10% of practicing speech therapists treat individuals with PD on a regular basis. On an average only around 27 post graduates pass out per year in Mumbai, roughly 50% of the same opt for a career in Speech language pathology. Conclusion: This fact highlights the need for increase in the man power development. This study on PD is a preliminary estimate of one of the many communication disorders that come under the treatment purview of a Speech and Language Pathologist. Objective: INCLEN Diagnostic Tool for Autism Spectrum Disorder (INDT-ASD) is an indigenously developed tool for the assessment of Indian children with ASD. This tool has been developed by the INCLEN group in India, and it is used by mental health professionals and pediatricians. This work was to demonstrate its clinical utility for speech-language pathologists (SLPs) and sensitize them to this new tool. Materials and Methods: Forty children between 2 and 10 years of age, with the referral diagnosis of ASD and social communication disorder (SCD) from the Department of Child and Adolescent Psychiatry, were enrolled for the study. Diagnosis was reviewed and the Childhood Autism Rating Scale was administered on all children. The children were grouped as (i) children with ASD and (ii) children with SCD, i.e., "no ASD." The INDT-ASD was then administered by an SLP, who was blind to group membership. Results: Thirty-nine out of forty children were correctly diagnosed by the INDT-ASD, showing high diagnostic accuracy of the tool. In addition to this, it is quick to administer, has very elaborate guidelines to observe different behaviors, a good scoring algorithm, and it is freely available in many regional languages. Conclusion: INDT-ASD is a simple and effective tool that can also be used regularly by SLPs and other professionals for the diagnosis of Indian children with ASD. Introduction: Individuals with Parkinson disease (PD) experience difficulty in production of voice. Evidence also suggests a possible deficit in Parkinson's individuals' perception of their own speech loudness. Aim: This study aims to determine perception of voice difficulties in an individual with PD and obtain family members perspective of the same using Voice Handicap Index. 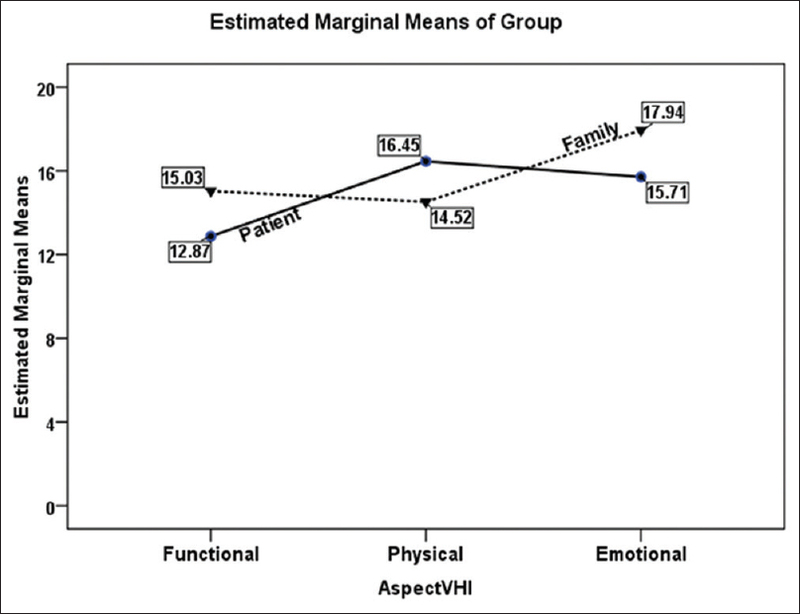 Methodology: 31 individuals with PD and their respective family members (N=62) were asked to fill Voice Handicap Index. Scores across three areas: emotional, functional and physical were compared. Two-way (factorial) ANOVA statistical test was used. 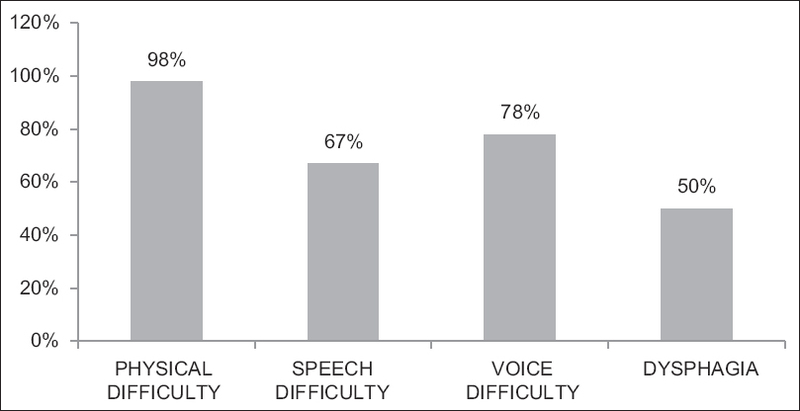 Results: 64% of the individual with PD and 70% of the family members felt that a voice difficulty exists. The results of ANOVA indicated that the score of the PD differed from family on overall mean scores on VHI. Also, the impact of a voice problem is more noticeable by the family member as compared to the individual with PD. The family members have perceived that the individual with PD has become more restricted in their personal lives and avoid speaking situations due to their voice difficulties. On the other hand, the individual with PD notice the physical strain, effort and difficulty to produce the voice. Conclusion: Planning a treatment, which focuses on all these aspects, allows the PD and family members to get a healthy perspective of the voice difficulties and improve overall quality of life. In a country like India, that still has a close family structure, involving the family and obtaining their perspective for management of individuals with PD is of significant importance. Objectives: The study aimed to develop and assess the effectiveness of a self-learning module in phonetic transcription of Tamil language for students of speech-language pathology. 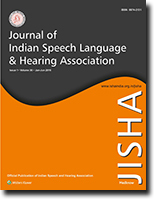 Methods: A self-learning module with information on phonetic transcription and sounds of Tamil was developed. Exercises for practicing transcription at the word and phrase levels were included in the module. Content validity of the module was established through consultations with experienced speech-language pathologists and linguists. Fifty undergraduate students of Audiology and Speech-Language Pathology (ASLP), with limited exposure to phonetic transcription, completed the self-learning module individually. The efficacy of the self-learning module was evaluated through a questionnaire, and a phonetic transcription task aimed at assessing the knowledge and skill of transcription. Participants completed the questionnaire and transcription task prior to and after completion of the self-learning module. Results: Postlearning scores on the questionnaire and phonetic transcription task were significantly higher than prelearning scores suggesting improvement in knowledge and skill of transcription upon completion of the self-learning module. Transcription accuracy increased for different categories of vowels and consonants. Conclusion: The self-learning module demonstrates promise as an acceptable and effective method for learning phonetic transcription by undergraduate students of ASLP.